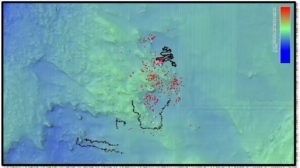 The 2017 field season of the Egadi Islands Survey Project continued mapping and documenting the Battle of the Egadi Islands landscape. 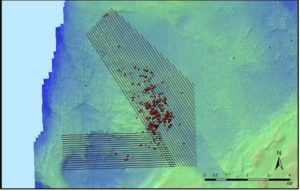 A side scan sonar survey was conducted along the main scatter area with the hope of producing a more detailed target area in the coming years. Prior to beginning survey operations, the R/V Hercules successfully recovered the Egadi 9 ram and mapped the location of the Egadi 2 ram, previously found by divers from Global Underwater Explorers. During the 2017 season, a side scan sonar survey was conducted in collaboration with GBT Offshore. The R/V Hercules was outfitted with a ship-mounted 500 kHz tow fish that was deployed off the stern of the vessel, 10 m off the seabed with 50 m range port and starboard, while maintaining speeds at an average of 3.4 to 4.2 knots. The software used to view the sonar images and record target data was SonarPro 11.1. Utilizing a Teledyne front facing BlueView 2D multibeam imaging sonar, the search was able to locate objects at a distance of 60 m with a 130-degree field of view (65 degrees to the left and right of the ROV’s heading). 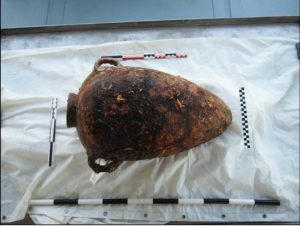 Artifacts located include: 73 Greco-Italic V/VI amphoras, 6 Punic amphoras, 10 pieces of tableware, 6 Dressel type amphoras, and the rim of a Montefortino type helmet. 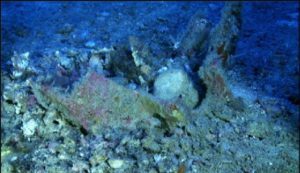 The Egadi 9 ram was originally located during an ROV survey conducted in 2012. 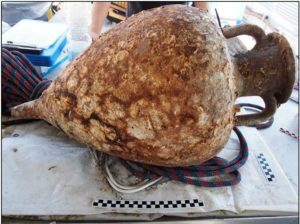 The ram was largely buried with its head pointed downward into sediment at about 45 degrees; only the back end of the ram was visible above the seabed. Rocky debris that surrounded the ram’s position was clearly the result of octopus activity over many years. 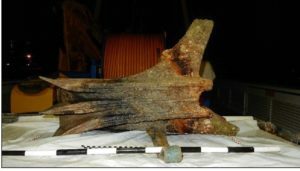 In order to conduct a safe recovery of the ram, the area directly around the ram was excavated using a water jet mounted on the manipulator arm of the ROV. A hole was dug around the ram to a depth of 50 cm, clearing an area necessary to secure the lifting strap around the ram. The following day the R/V Hercules returned to the site and after completing a few final strap adjustments lifted the Egadi 9 to the surface. Wood Samples were collected from the 11 raised rams for analysis. Samples will be analyzed at the British Museum scientific laboratory under the direction of Dr. Ross Thomas. Tests will include species identification, wood DNA, and radiocarbon dating. Finds from the 2017 survey bring the total number of Greco-Italic amphoras found to 628, Punic amphoras to 56, and 30 pieces of tableware. The additional 6 Dressel type amphoras brings the number of non-associated ceramics to 31.